In an effort to provide additional opportunities for meaningful participation early in the operational planning process, SLS is offering a collaborative stakeholder planning session. SLS values stakeholder input and wants to provide opportunities for collaboration to improve operational plans. 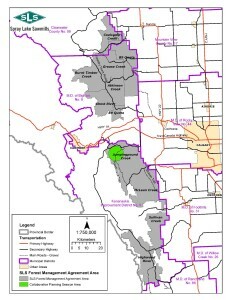 The Jumpingpound Creek Planning Session will be held on May 13, 2016 at the Spray Lake Sawmills office in Cochrane, starting at 10:00 AM until approximately 3:00 PM. Lunch to be provided. Please see the attached compartment map for location details. If you would like to contribute to the planning process but are unable to make the session, please email woodlands@spraylakesawmills.com and alternative arrangements can be made. If you are interested in participating, please RSVP to woodlands@spraylakesawmills.com by May 11, 2016. 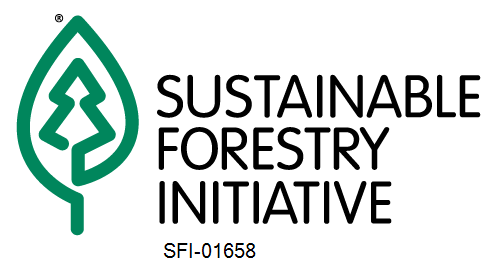 Mountain Pine Beetle, forest management plan, wildfire mitigation, etc. Please note; these sessions are specifically scheduled for planning upcoming harvest operations for their respective compartments. This is not an appropriate venue for discussing broad forest management practices such as Operating Ground Rules, land use planning or concerns outside of the indicated compartments. Please contact SLS at woodlands@spraylakesawmills.com with any questions. We look forward to seeing you at the session. Can you please clarify why the map was changed? 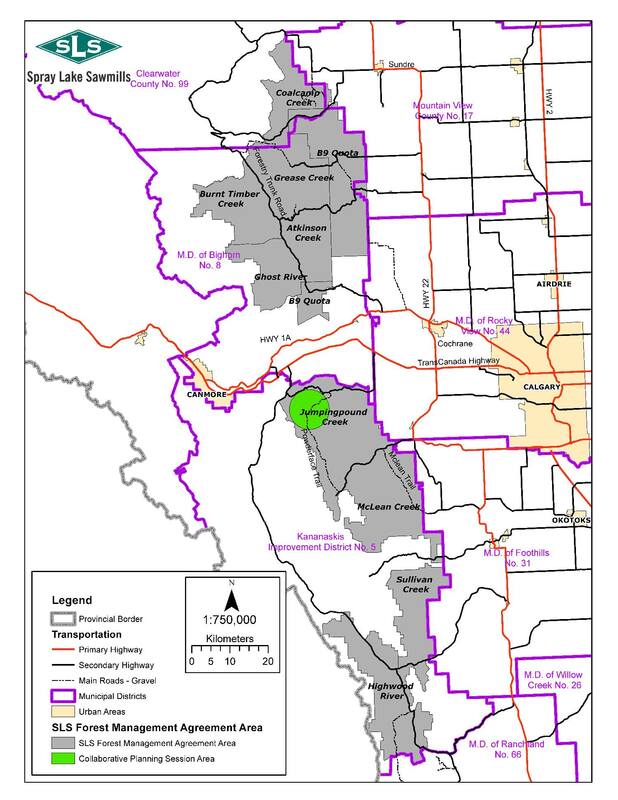 The area now depicted is much smaller than the original map which had the entire jumpingpound area from hwy 66 to hwy 68 and west of Powderface Road highlighted. Is the current map depicting the only area to be logged, or is it the only area that SLS is involving in a consultation process? Thank you for your comment Shaun, I apologize for the confusion. The map was updated to more accurately represent the harvest area for discussion at the Collaborative Planning Session (CPS). The highlighted area is currently the only planned harvest area in the Jumpingpound Compartment in the next 5 years. SLS is looking at approximately 20% of the highlighted area for harvest. For clarification, SLS has an in-depth consultation process for every harvest area from the DFMP level to block level. The CPS is held annually for every area 2 years in advance of harvest. Thank-you for the clarification, What percentage of the highlighted area is harvestable? Thanks for your patience Shaun, the highlighted area is not a working area or compartment so I do not have firm numbers on net land base in that specific area. This is simply a mapping exercise to show the location to be discussed in the upcoming session. I would not be confident in providing you a number regarding the harvestable area within the highlighted section. Any SLS operations will be subject to Alberta approval and be in alignment with the objectives of the DFMP. Is this why Powderface Trail (the road) is still closed, despite being completely fixed nearly 2 years ago now? Thank you for your patience waiting a response. I contacted Alberta Transportation for the following information: Powderface Trail is seasonally closed Dec 1 - May 15 inclusive. Due to the 2013 floods, it has not been open May 16 - Nov 30 until work can be complete. Work in ongoing with the goal to be complete May 15, 2016 and open the road May 16, 2016. Please contact Alberta Transportation for more information, as they are the authority for this road. Thank you for your comments & questions. Allen is out of the office until Thursday. He will be able to respond then.